1) Right-click the root Project tree node. 2) Choose Add Data Source from the shortcut menu. 3) (Optional) Change the data source label in the Name field of the Data Source panel. 4) Choose Database from the Type box. * Driver: Type the path to the appropriate JDBC/ODBC driver, including the package name. The driver that you enter must be available on your CLASSPATH. To add the driver jars (or zip files) to the CLASSPATH, goto File -> Customize Preferences, then add the file(s) under the "System Properties" section. * URL: Type the appropriate URL needed to access your database. * Username: Type a valid username for this database (if the database requires passwords). * Password: Type the password for the given username (if the database requires passwords). * SQL Query: Type or copy the SQL query that expresses which data you want to use. These steps seem to be outdated using SOATest 9.9. Although I've added the drivers (tried both db2jcc4.jar and db2jcc.jar) in JDBC drivers preferences, when I try to add a DB2 datasource, I'm still presented with the error, "Could not load driver class for DB2. 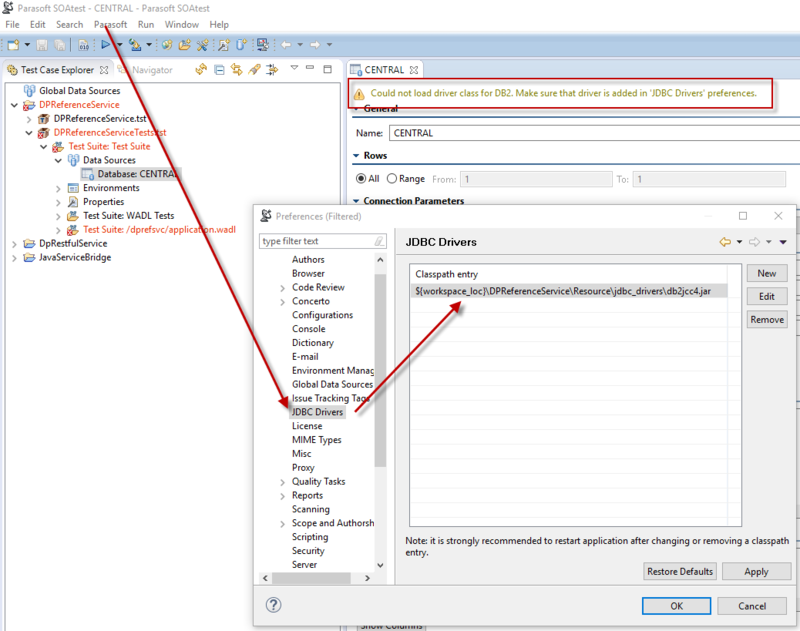 Make sure that the driver is added in 'JDBC Drivers' preferences". These are current drivers. SOATest may require additional JARs to access your DB2 databases, depending on the version of DB2 database. license files may be added to the SOAtest JDBC drivers list. Please refer to DB2 materials for details"
Therefore, depending on your version of the DB2 database you may need the above mentioned JDBC JAR and possibly others. You would need to see DB2 resources for more details on which JARs are necessary for your exact version of DB2 to be accessed by other tools. Did you restart your SOAtest instance after adding your JDBC jars to your Preferences? Please ensure you restart the tool in order for SOAtest to load up the necessary JARs!!!!!!! Thx Ramiro Martinez. I'll look into that. Ramiro Martinez It appears that the license JAR doesn't exist in these packages anymore. I've tried several locations, including the one provided in the help docs, and I still received that message. The database I'm currently targeting is DB2 9 fixpack 7.